I don’t know about you, but I love talking to inspirational people who, no matter what, have this uncanny ability to make me feel like I can do absolutely anything! It’s like getting a super-charged shot of B-12 or like having an adrenaline rush without being put into a fight or flight scenario. Who wouldn’t want a piece of that?! That’s why I’m so excited to bring you the first in a three-part series of podcast interviews with entrepreneur Shawn Anderson. Not only is he a best-selling author, motivational speaker and success coach, he’s also the founder and CEO of the Extra Mile America Foundation, a nonprofit organization that encourages positive attitude and action by empowering individuals, organizations and cities to go the extra mile. One of the things I most appreciate about Shawn is his humble attitude. He doesn’t play up all that he’s accomplished and believe me, that’s a lot. What he does play up are amazing stories of what others have accomplished. Shawn’s extra mile story started when he biked 4,000 miles across the US in 2009 with the sole purpose of meeting and acknowledging extraordinary people. With events in 21 cities from Sacramento to Boston, he met with more than 200 extra mile people. People like Lisa Osmond who, after losing her 17-year-old son in a car accident, became a leading spokesperson for “Yes, Utah,” an advocate for organ donors. People like Sheila Holzworth, an international athlete who has been blind since the age of ten. In the end, Shawn donated $1,000 to each of the ten most inspiring extra mile people. Then, to share the inspirational stories of as many people as possible, he wrote Extra Mile America: Stories of Inspiration, Possibility, and Purpose. The best part about meeting Shawn is that he gives all of us the chance to become extra mile advocates! Did you know you could nominate an extra mile person? Is your city an extra mile city that celebrates the bravest, most inspirational in its community on November 1 of each year? 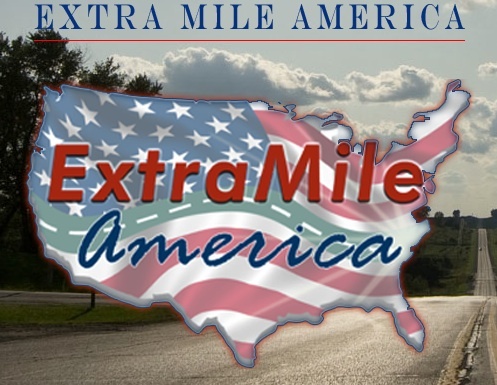 Find out at the Extra Mile America Foundation website. Who knows, maybe your mayor will stand up on November 1, 2012, and acknowledge residents from your city who have made a difference! You can hear all of my podcasts on my free members’ page. Check them out!